This striking Japanese Happi Coat offers dramatic style with its dragon and bamboo pattern. 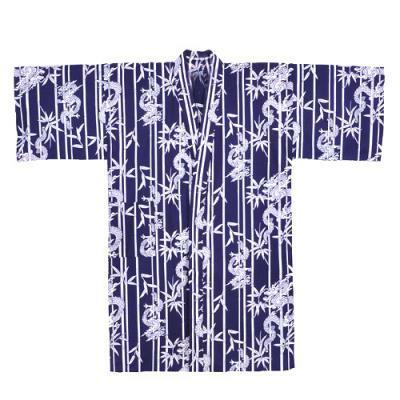 A happi coat is a shorter length version of the kimono and yukata. In Japan, the dragon is known as a water deity and is associated with rainfall and bodies of water. Bamboo has been revered for centuries for its delicate beauty, and is a symbol of endurance. This loungewear is detailed in a crisp navy blue and white design. Made in Japan of 100% cotton, the lightweight robe has a side pocket, and a matching belt is included. A happi coat is perfect to wear when relaxing at home or as a cover-up after a shower or swim. Easy care cotton with a shrink resistant finish. Machine wash cold water for best results. This Happi Coat is available in size: Medium/Large. Medium/Large, measures 45" in length and is designed to fit a man 5' 5" to 5' 11" in height. The sleeve length is 14", shoulder width is 29" and the girth is 52". For sizing reference, girth is the entire width of the fabric, so this robe easily adjusts to many waist sizes. It is designed to wrap around your body and be tied with the belt. For length, measure yourself from the top of your shoulder and down your side to determine where the length will fall on you.